Hi all, I Hopefully have a simple question. I have a 1996 Ford ranger, 2WD with a 8.8 Rear Differential. My vehicle is at 120K miles and while I'm not having any issues or noises I'm figuring I should probably replace the rear wheel bearings and seals but am unsure how much fluid will come out when I pull the hub seal. Could anyone who's done this please let me know so that I can avoid a smelly mess of diff fluid all over my brake hardware? Yup to even get to the bearings and seals you have to pull the axles. That requires pulling the c clips off the axles inside the differential. So a full drain is required. Don't bother doing this. As stated already diff has to come apart to do this. You only change those bearings and seals when they fail. It's a pretty big job. Just swap the fluid again if you want to. 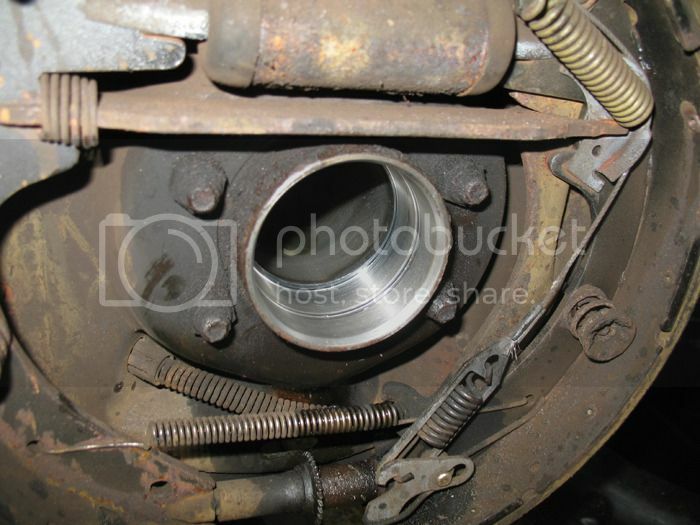 Just to verify, I'd have to pull the axle before accessing the bearings which are in the vicinity of the brake drums? There's a lot of videos for it. Thanks, I saw that the shaft and hub are a giant piece when I was working on my brakes today. Thanks, I may just do them the next time I drain the diff in 60K miles or so as I only see the fronts mentioned on service schedules. It's a pain in the neck. I replaced my drivers side axle shaft bearing recently. I had some bad sounds coming from the rear end and I was hoping that it wasn't the differential and just the axle shaft bearing. But, after replacing the bearing it's evident that it's totaly the differential on my truck (2003 Ranger 2WD 220,000 miles) as all the bad sounds are still there. Like someone else said, I deffinitely would not go through the trouble of replacing that unless you hear whirring, wobling, or grinding sounds coming from that wheel. Because I couldn't see exactly what I was dealing with, I wound up chisleing the seal out piece by piece. Then after that I tried to use the slide hammer to pound the thing out and it still would not come out. The factory installed axle shaft bearing housing seal has got an outer lip that seats against the end of the axle shaft housing end. But I could not see that fact at first because it was rusted to the end of the axle shaft housing end. It was only after I spent like an hour plus chiseling the seal out that I noticed a tiny crack on the end of the axle shaft housing end. I then just simply took a one inch sharp flat chisel and tapped it into the crack all around to wedge it outward and loosen it up and bring it outward a little. 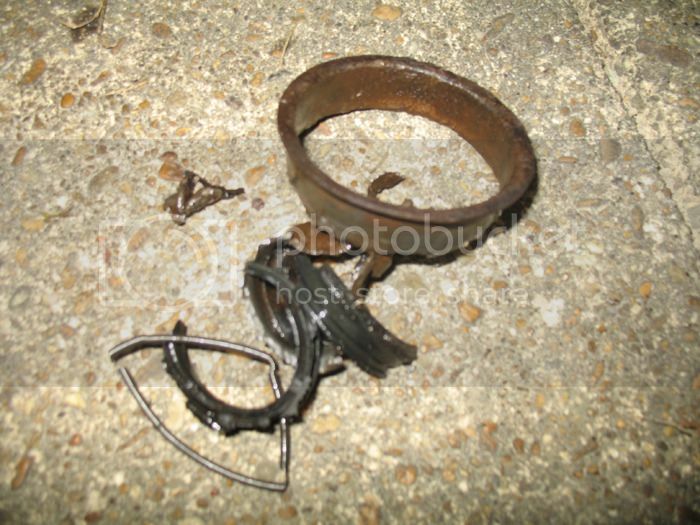 After the rust cracked and it was loosened I then was able to pound out the bearing and that seal cup piece together with the slide hammer. But you can't ascertain this at first because of the rust. Mangled remains of the seal after chiseling it out. 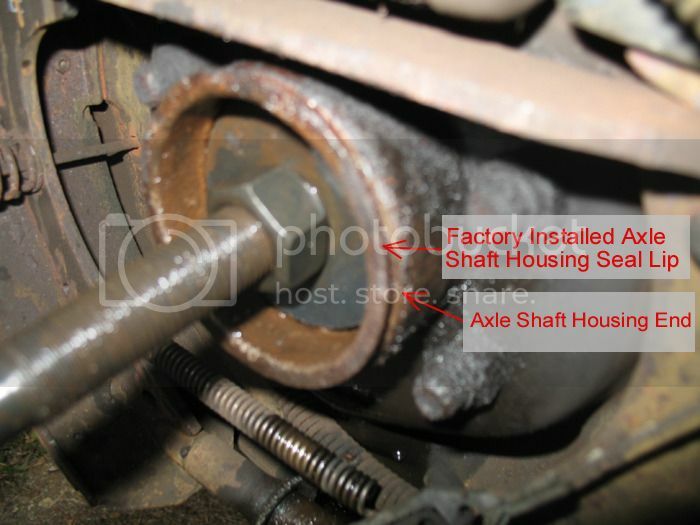 I bought this axle shaft bearing from Advance Auto. It's called a "repair" bearing. 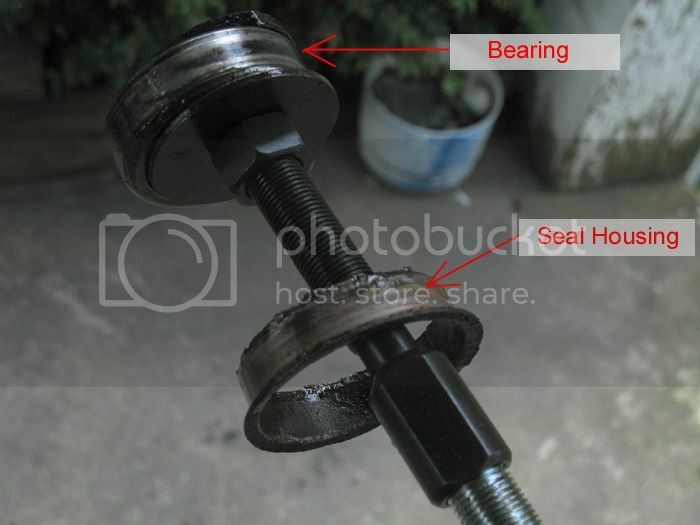 The bearing and the seal are incorporated together as one piece. 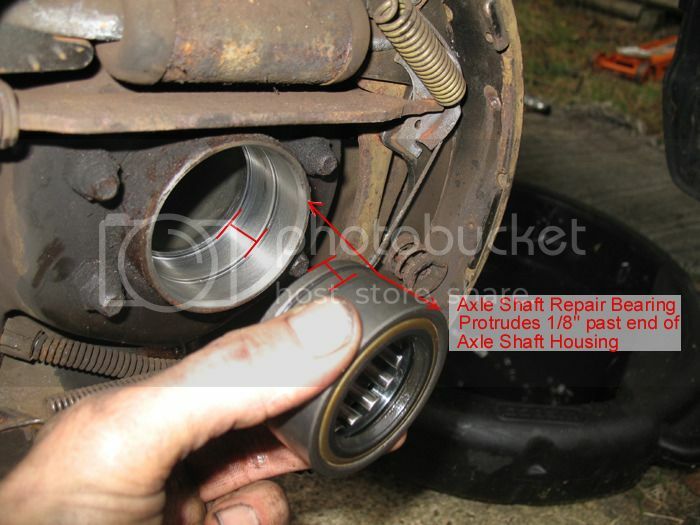 It works ok, but as you can see in the pic below, the width of the inside area of the repair bearing is narrower than the width of the section in the axle shaft housing. This makes the bearing stop short and cause it to protrude like 1-2 milimeters outside the axle shaft housing end. 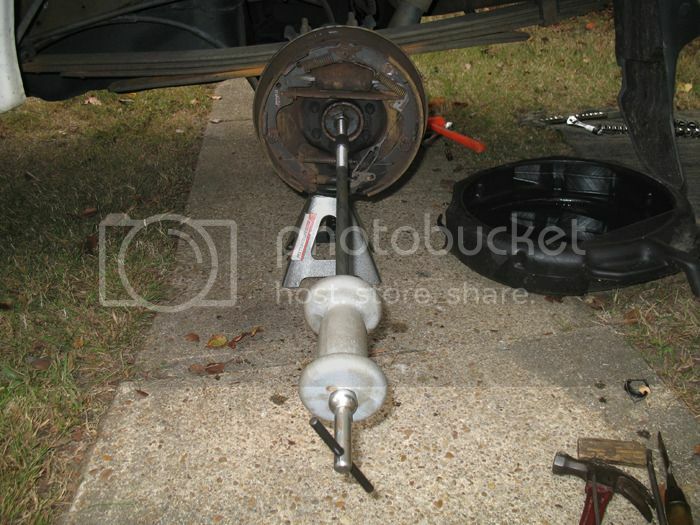 It makes no difference though because the axle protrudes well past that and it does not interfere with the axle at all. You can also buy an OEM bearing and the seal separately. I have had no problems with the repair bearing so far. Those bearing puller ends are threaded 5/8 - 18. Harbor Freight does not sell a slide hammer with a post end threaded such, so I then went for this 5lb slide hammer that is also threaded 5/8 -18 for the puller ends. All total I spent like $85-$90 on the slide hammer and bearing puller attachments, but I figure a mechanic would charge like $300 plus to replace a bearing like that, so I got it done for the price of the slide hammer set and I get to keep the tool to do any axle bearings in the future for free. Always worth it to buy whatever tool you need rather than take it to a mechanic. Tools always pay for themselves after the very first time you use them. By the way, this slide hammer set from Harbor Freight Tools will not work. The collets (end attachments) are to small.